Bruce Davidson’s series; Subway, is a collection of images from the underground railway of New York City. During the 1980’s Davidson spent a large amount fo time capturing the dark, dangerous world of the subway. Shooting in colour, Davidson saw himself as a hunter stalking his prey. He soon sensed that the subway had its own peculiar psychology. “People in the subway, their flesh juxtaposed against the graffiti, the penetrating effect of the strobe light itself, and even the hollow darkness of the tunnels, inspired an aesthetic that goes unnoticed by the passengers who are trapped underground, hiding behind masks and closed off from each other.” One of the defining parts of Davidson’s work is the contrast between the cold, dead eyes of passengers trying their best to ignore their fellow travelers and the face paced, closeness of public transport; the large amounts of graffiti that plagues the carriages is almost a metaphor for New York, Its hustle and bustle, its crime, poverty, affluence and spirit. 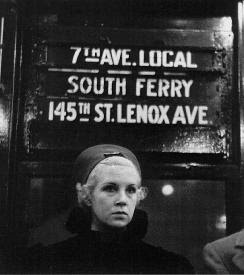 Davidson must surely have been aware of Walker Evans’s own series of subway photographs, which the older photographer began taking in 1938 but did not publish until 1966, in a volume entitled Many Are Called. They make an interesting contrast, Evans made his name capturing the bleak, stark nature of the migrant poor during the great depression. On one level, his subway photographs can be read as a rejection of his earlier work, the carefully composed, formal photography to this down and dirty hidden camera photography. He travelled the subway with a miniature camera hidden inside his jacket, with the lens poking out the gap between the buttons. In Evans’ work the subway appears to be a very different environment to Davidson’s closed, bleak, violent subway. In Evans’ series, there is little evidence of the urban poor, no graffiti and only the occasional advert. Davidson’s work portrays the subway in the same way I see the London Underground; as a social equalizer, everyone is travelling in the same cramped, hot, noisy metal box, all with somewhere to be and carefully, everyone just as scared of each other no matter their appearance. His work in in your face, a bold statement, he got on the subway and shoved his lens brutally into the lives of everyone on the subway, its style conflicts with the subtle, polite nature of the underground, the quiet reserved thought of passengers he caught in his lens are slightly angered, a look of mild disgruntlement at having their day disturbed by a man with a camera. Evans on the other hand while he is still invading on the reserved area but in a much more subtle way, his camera hidden behind his jacket, he took much more secretive shots, his image below, is one of the few where someone has discovered his camera, he managed to take the image just as they found it. The mild interest on their faces is very different to the rest of Evans’ work, they don’t even seem to be annoyed at having their photo taken, their look intrigued me particularly as a photo that I myself could never replicate, a perfect moment in time.